We make the following assumptions about the input images. The images contain only three different pixel values: for the background, the dice and the dots on the dice. We consider two pixels connected if they share an edge - meeting at a corner is not enough. 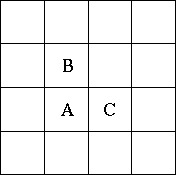 In the figure, pixels A and B are connected, but B and C are not. A set S of pixels is connected if for every pair (a,b) of pixels in S, there is a sequence a1, a2, ..., ak in S such that a = a1 and b = ak , and ai and ai+1 are connected for 1 <= i < k.
We consider all maximally connected sets consisting solely of non-background pixels to be dice. `Maximally connected' means that you cannot add any other non-background pixels to the set without making it dis-connected. Likewise we consider every maximal connected set of dot pixels to form a dot. The input consists of pictures of several dice throws. Each picture description starts with a line containing two numbers w and h, the width and height of the picture, respectively. These values satisfy 5 <= w, h <= 50. The following h lines contain w characters each. The characters can be: ``.'' for a background pixel, ``*'' for a pixel of a die, and ``X'' for a pixel of a die's dot. Dice may have different sizes and not be entirely square due to optical distortion. The picture will contain at least one die, and the numbers of dots per die is between 1 and 6, inclusive.